Questions tagged with music can live without it. They usually refer to a music-related application, which doesn't have any added value when it has the music tag. Most of the top questions of this tag are off-topic and can be closed. No. Most of the questions I came through are general and refer to music applications, not programming. Use juce for questions related to the cross-platform GUI library, Juce. Use midi for questions related to the MIDI protocol. Use music-notation for generating or processing scores or guitar tabs. Use music-theory for algorithmic/software approaches to music theory including identifying chords. Use playback for just playing a sound. Use signal-processing for approaches to extracting pitch or other information from a wave or sound file. 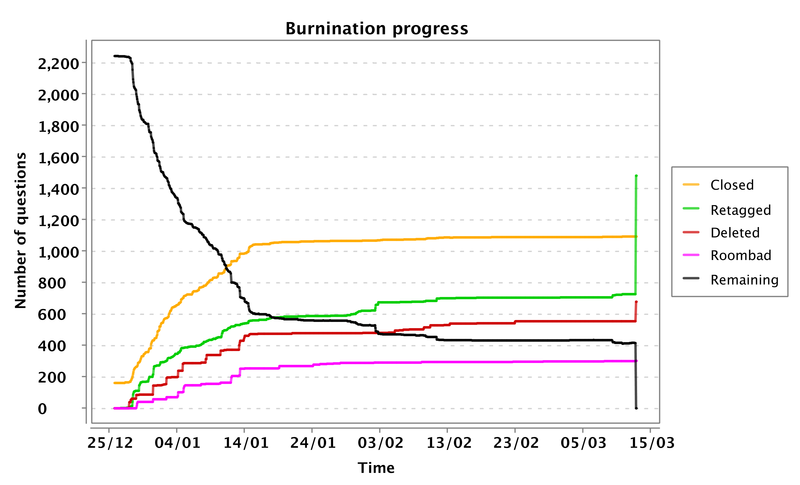 Track the progress of the burnination! Remember that music has more than 2400 questions. Therefore do not go through all of them! Retag the ones which are worth saving (usually the top voted posts) and vote to close the unsalvageable questions (usually the very low scored). We don't want to destroy value, so salvaging a post should be your first priority. If a question can be saved, please edit it. Your edit should improve all problems with the question and remove the music tag, possibly replacing it with another tag, as described above in "Observations/Retag Guidance". Unsalvageable questions should just be flagged/voted for closure. They don't need to be retagged. If the question is not appropriate for this site, then don't worry about removing the music tag —just flag/vote to close the question. 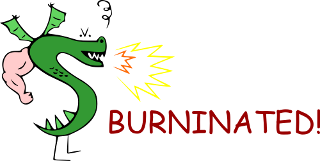 At the end of the burnination process, all questions which still have the music tag should have been closed. These will be mass-deleted, which will remove the tag from the system automatically, with minimal disruption. Having reviewed a few pages of questions tagged music, I don't see anything that is not better serviced with more precise tags such as audio or midi or audio-streaming or sound-generation or similar. There doesn't seem to be any field of knowledge, expertise, or interest that the tag helps target. Even interest in music in general doesn't tie the questions together in any meaningful way that improves the taxonomy of the site or help people navigate to things they are interested in. A quick look at the tag description for music makes it seem like a reasonable tag and there are perhaps a lot of questions misusing it. However, when looking at the two examples of "good use of the music tag" questions in the description (one closed, the other should be as off topic), and the top questions for the tag (several are closed, others look to be either off topic, don't need the music tag, or just don't benefit from it) it would seem that it isn't adding anything useful to the questions. Much as I like to listen to music, I say we should let the music tag burn. I write music, I write code for music, whether using midi, audio, and any kind of synthesis. If one were to use the tag to find an interested topic, then again, the tag would not be precise enough because if I search something on music, it actually be related to juce, or midi, or something else. I have been trying for some time to set the music tag to refer only to those questions that refer to computer approaches to music that cannot be applied to any audio/sound file or to the specifics of midi, such as generating music notation or computational music theory. (I wrote the current tag description for music). But it seems to be a losing battle, and it'd probably be easier to make music-theory and music-notation tags -- they won't have nearly as many questions tagged with it as "music" currently does, but it'd be much easier for someone to find those questions any how. I'd be happy to let it burn, but I'd like to try to take some time to retag the small percentage of properly tagged questions with the new tags first. … [game] over: Insert coin to blacklist?